The Government says it had briefly considered making it compulsory for beneficiaries to move to Christchurch when their skills and a job could be matched. Wisely, that was discounted....The compulsory uprooting of men and women and, conceivably, families in a manner such as this is clearly a step too far. Why? Labour did it. Has everybody forgotten Jobs Jolt. 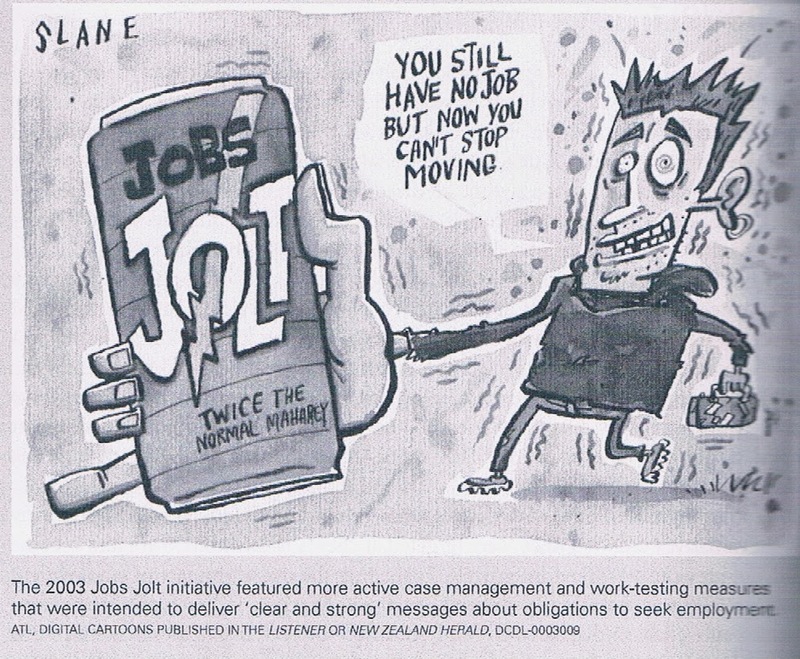 Jobs Jolt made people move to where the work was without a $3000 financial incentive. The Government would pay the moving costs. But it would not continue benefits forever for those refusing to shift. The package would reinforce that those receiving the dole had clear obligations under the law to be available for work and to take reasonable steps to find a job. Mr Maharey said the provisions available to suspend benefits would now be used more frequently. National down (48.5 to 42.5%) in today's Roy Morgan Poll - the one that is usually friendly to Labour. Pretty much a reversal of the last poll when National was up 5.5%. Roy Morgan also surveys on the topic of unemployment. Their rate is always above the official rate. Their sample is smaller than Statistic NZ's and I suspect changes with every wave. Their March quarter rate was 8% (compared to the HLFS rate of 6%) but most importantly the trend is the same. Reducing. Duncan Garner has a point about the dichotomy between high labour needs in Christchurch and the 67,000 young Kiwis not in training, education or work. While only 40 percent of those are actually on the "dole" that number is still unnecessarily high. The government has put some effort into getting locally unemployed into jobs, but there are still around 1,600 benefit-dependent unemployed 18-24 year-olds in Canterbury alone. Perhaps the problem is skills are required now and apprenticeships divert qualified tradesmen away from the job at hand? But I agree with Garner. There appears to be a golden opportunity going begging. The same can be said about job opportunities the needs of our ageing population will present; more residential carers, in-home carers, various health workers, home maintenance providers, etc. While the government funds much of this, it makes total sense to be diverting dole money into training for these roles. How hard can it be? The answer must be 'very'. It's easier to import able and willing workers and hope their productivity and taxes will support the unemployable. So good on the government for this initiative. “Where are these people, coming into the region to take up paid work, going to live? There is an increasing shortage of affordable rental properties, more people moving in from overseas to take up work, and more Cantabrians moving out of their homes for repairs or rebuild. “ There is just nowhere for these new people that the Prime Minister is paying to come to Canterbury, to live. That is a recipe for disaster." Up to 1,000 young people present much less of an accommodation problem than the non-beneficiary inflow already occurring. They present an opportunity as boarders and flatmates. More negativity from Labour for the sake of it. Social Development Minister Paula Bennett announced today a new community finance partnership that will see interest free and low interest loans made available to New Zealanders who need them. The Government is partnering with Bank of New Zealand, Good Shepherd NZ and The Salvation Army to develop a finance initiative that will offer people on low incomes affordable and sustainable credit. Good Shepherd will bring many years of delivering community finance programmes in Australia to the table. “People on low incomes are vulnerable in their credit options with many tempted by easy finance. The initiative will see sustainable loans available for some people that might not otherwise be able to service a loan with high interest rates and hidden fees,” says Mrs Bennett. Beginning with a one-year pilot, BNZ is committing $10 million to the initiative for up to five years that provides a real alternative to loan sharks and pay day lenders. Hard to comment without detail beyond the obvious observation of more subsidy. In terms of moral hazard, not the worst sort of subsidy though. There's a chance the expenditure might be budget neutral. When beneficiaries get into financial trouble the state ultimately wears it (or shares it) even if paltry repayments are deducted from benefits. 69 percent said CYF were 'not useful' or of 'mixed use' and 77 percent thought the new attendance service providers were not useful or of mixed use. Dealing with truants and dysafunctional kids is probably a thankless task much of the time. But I shouldn't think MSD will be very happy with these survey results. You would hope this data is identifiable by school and can be used to assess which service providers/ CYF agencies are getting it right and which aren't. ...inflation is actually very low. What is the demand that actually fuels the current account? It is not the spending of the low income families that are barely surviving. Forcing them into KiwiSaver is going to reduce the very demand that keeps their local economies going. Making them save even more to balance the economy in boom times is a bizarrely regressive idea for a Labour government-in-waiting. Out on that chemical frontier we had a wild, wild west. Part of the problem with the new regime is Prime Minister John Key's reluctance to authorise testing on puppies and bunnies - but he's thinking that rats and mice might be okay. Mickey can get high but not Peter or Pluto. Regarding Rodney's suggestion (channelling the populist vote), "We don't want drug-taking out in the open", I was reminded that my husband has twice put the question during Campbell Live, Why don't they take their cameras and microphones and stand outside a tinnie house?